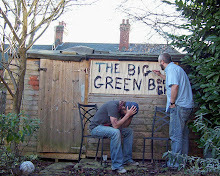 I thought it was about time we started doing this blog thing a bit more often , so this is the reasion I am writing this. So now you know. Firstly, and most importantly, we're still here. Which in the current climate, is worth mentioning. I think it's very sad that Prospero's Bookshop in Crouch End closed down on December 24th. The shop had been there for well over a decade and as I used to live in Crouch End when I first moved to London it was a bookshop that I visited on many occasions. And only being 20 minutes walk from us it was a bit of a shock. And today we heard that British Bookshops has entered administration, which again raised questions about High Street bookselling. And if you add to that news of 20 Waterstone's closing this year after the HMV Group's poor Christmas, you may be thinking, 'blimey, bookshops are knackered'. Well, let's hope not eh? Christmas is over and despite the cruddy weather, our loyal band of customers braved the extremes to come and buy there literary goodies from us. Our flyering campaign brought in a lot of new customers too, so all in all it was an OK Christmas for us. The Saturday before the big day is traditionally one of our busiest days and like the rest of the retail world we were looking forward to a bumper day of sales. Of course at about 10.30am the snow decided to fall at an alarming volume in the South East of England. Particularly Wood Green obviously. Traffic came to a standstill and we spent nervous moments looking out of the shop to see if we could see ANYONE brave enough to take on the blizzard. 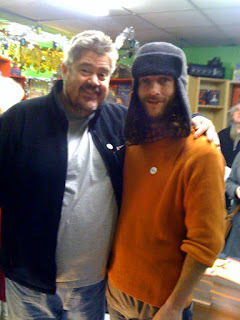 One man who did was Phill Jupitus, who kindly agreed to come and visit us on that day to sign his book and to keep the punters happy. Here he is, with a very relieved looking me. We'd also persuaded the Tottenham Choir to join us for carols as well and amazingly about 18 of them made it to the shop to add some festive fun. Phill was great and spoke to everyone who came along and in the end stuck around for a couple of hours. And lots of people did come along too, which was great. So, as we read stories in the newspapers the following Monday about how badly the shops had been affected by the snow over the weekend, we breathed a huge sigh of relief that the mighty Mr J and the lovely Tottenham Choir had visited and saved our weekend for a total whiteout. So now it's January and we have corporation tax, 3 months rent and all the publishers bills to pay and things have calmed down a bit. It's not going to be an easy year, but we're going to go all out to make it amazing. We know that there are alternatives to buying books on the High Street, but we've always tried to be more than just a place that sells books. We hold book launches , comic & magazine launches, we have author talks, celebrity signings, author q + a's, readings, we've had stand up comedy, burlesque dancing, we visit schools with authors and even do workshops ourselves now, we have storytelling and singing (I have the voice of an angel) on Fridays, we have two reading groups, a writers group, we have a monthly quiz, the shop is used as a meeting place for local organinzations, we do poetry readings, we support local voluntary groups, we have a writer's surgery where authors come and talk to wannabe published authors to offer advice and we have free tea and coffee all day (usually). I'm sure there's stuff i've missed out, and I know there's stuff we have planned for this year that will be ace. Ultimately, we want to be an integral part of Wood Green's community and we hope that this is slowly becoming true. We bloody love what we do and we bloody love where we're doing it, so on behalf of all bookshops (especially the indies), please keep supporting us.